On any given bluebird spring or winter day as I drive down Sunnyslope Hill, my eyes are drawn to the triangular symmetry of the northeast face of Mt. Cashmere. On good snow years it holds flutes of powdery goodness interrupted by rock bands and cliffs. If I look hard enough, I imagine a skiing line right down the gullet, and wonder if it’s too steep to ski. On this particular April weekend, I knew the avalanche hazard was high. 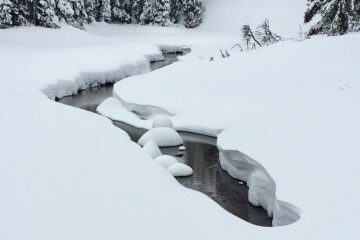 The temperatures were forecasted to increase dramatically, causing the recent snow to settle over the weaker layers that possibly lurked below. All these unknowns! Maybe that’s why I couldn’t find anyone to ski Mt. Cashmere with me. In fact, I wasn’t even too sure about the conditions as the alarm roused me from a deep sleep at 5:00am. However, I’m a “learn-by-doing” type person and decided to go have a first-hand look at the snow and decide as I went along. By 7 a.m. I’m moving onwards. There are many signs of spring: climbers geared up and approaching the roadside crags; a smattering of tents in the Eightmile and Bridge Creek campgrounds; about a mile of road to walk as the Eightmile Road has melted out; and, on the Eightmile Lake Trail, the large footprints of a bear. I veer off the trail up Pioneer Creek. From there, I take the easiest, safest line up to the summit chutes. The beauty of this south side approach to Mt. Cashmere is that its flanks are adorned with many ridges on which to travel uphill, thereby easing the anxiety of having to climb in a gully on a potentially hazardous day. Another reassuring sign: the day is comfortable but not heating up as much as I expected. I boot up the last couple hundred feet to the summit. 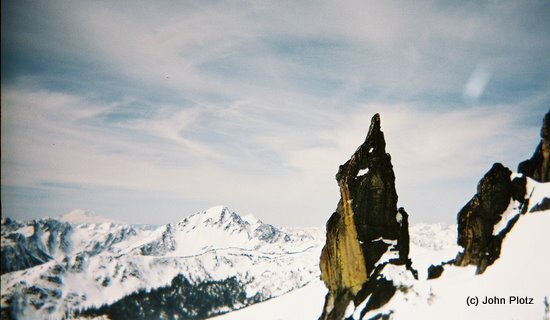 On the summit block, I throw on my shell jacket to stave off the icy wind and look down at my objective. I had been wrestling with the thought of skiing the N.E. face the entire day. It’s a steep, committing line with rocks and cliffs. Retracing my ascent route back on the south slopes would be safest and easiest, but if the powder snow I’m seeing on the north is stable, it would provide a more exhilarating ride. I click in just below the summit and take a couple test turns in the soft, billowy powder that is such a contrast to the south-side corn I ascended. My style of descent is cautious: turn, turn, stop. The slope soon rolls over, and at this point I’m committed to the line. It’s so steep that at times, all I have to do to initiate a turn is release my edges and lean ever so slightly downhill. The powder holds perfectly, but I have to watch my “slough management”. After each arc, loose snow shoots downhill and eventually fans out on the mellower slopes below. The sloughs could knock me over if I’m not careful about where I turn. But this ‘problem’ affiliated with the steeps also makes each turn exciting and joyful. 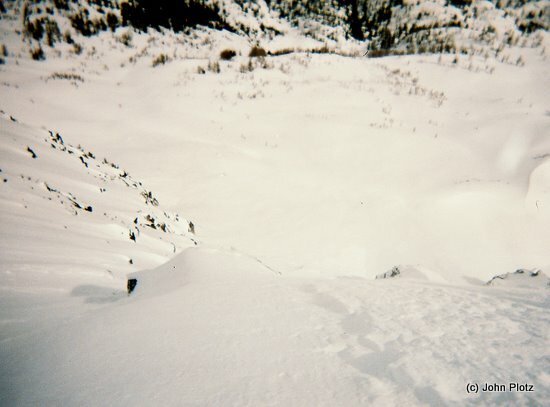 Approximately 1,500′ below the summit, I’m in an immense north-facing basin, looking back up, and surging with adrenaline. I stand there for some time, finding it difficult to quit gawking at the tracks I laid down the face. Reluctantly, I turn and climb out of the north basin, back to the south side. 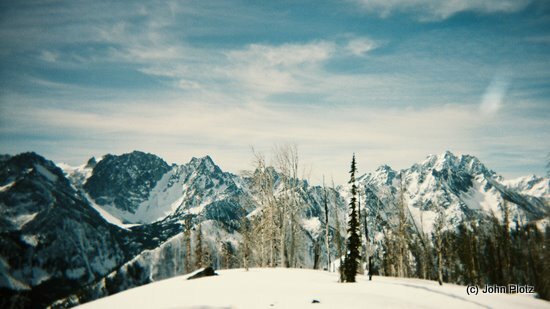 From there, it’s another few thousand vertical feet of skiing through silky corn snow and warm spring sunshine. More joy! The adrenaline and endorphins juicing my system have given me an extra surge of positive energy. The hike over bare ground down to the car falls away effortlessly. I stick to the margins of the road where there is a plush carpet of pine needles–my knees are thankful. The air is warm, calm, aromatic…perfect. This is spring in the Icicle, and I’m lucky to be a part of it. Elevation Gain: 7,900 if doing this route; 6,400 if descending the ascent route. Fitness: 3+ to 4 (advanced). Follow the Eightmile Road, which intersects the Icicle River Road at Bridge Creek, uphill for 3 miles. At the Eightmile Lake Trailhead follow the trail for about a half mile to an elevation of 3,700 feet then head upward cross-country, first in NNW direction, but generally in a NW direction. 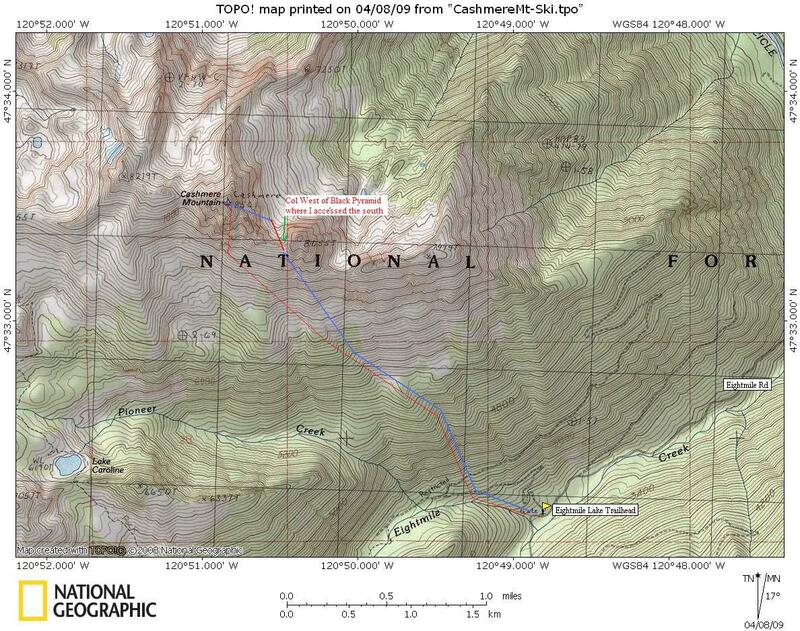 Our topo map below shows you what you need to know from this point on. 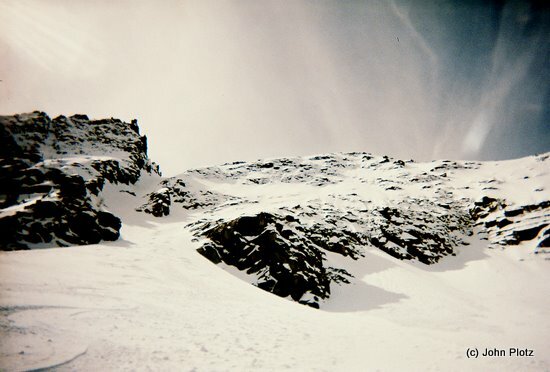 For the descent: return the way you came or, if you ski the NE Face, climb back to the south side through the notch just west of the Black Pyramid (aka the East Pyramid of Cashmere). Hazards. Avalanches can and do sweep portions of this route–know how to evaluate stability and use terrain features to select a safe route. Falls on the NE face are also not recommended. Maps. Print our topo map below on 8.5”x11” paper in landscape mode. Note: Use ‘Print Preview’ to properly orient and scale this map before printing.